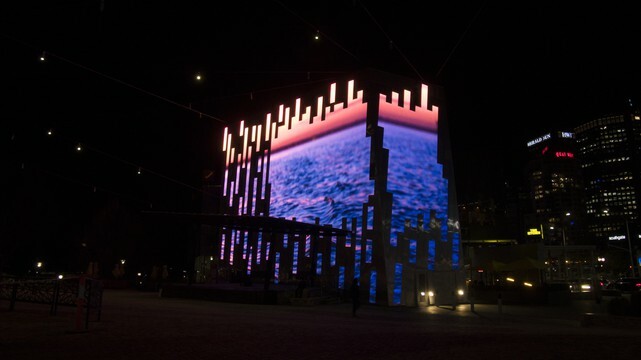 Ramus designs Melbourne’s first weather-reactive light installation, The Light House at 888 Collins Street. Towering lines of LED light cleverly combine to create a luminous façade that responds to rainfall, cloud-cover, wind speed and temperature. Tapping into Melbourne's collective weather watching obsession, 888 Collins Street was developed as Melbourne’s first real-time weather display. Towering lines of LED lights cleverly combine to create a luminous façade that responds to rainfall, cloud cover, wind speed and temperature. The 15-storey residential development is wrapped in a luminous skin that interprets incoming weather data and translates it into beautiful digital visualizations. On the hour, the building displays the next day’s forecast from a Bureau of Meteorology data feed. At all other times, the façade reflects real-time weather conditions collected by a weather station installed on the rooftop. Content is displayed across 2.4km of custom designed and fabricated linear LED light fixtures embedded into thirty-five full height vertical fins that flank 5,500m2 of building façade. The entire building is illuminated by the energy produced by solar panels installed on the building. Facade type and geometry (structure) : 888 Collins St is a residential building and is the canvas for a word-first artistic light display that’s as practical and beautiful. 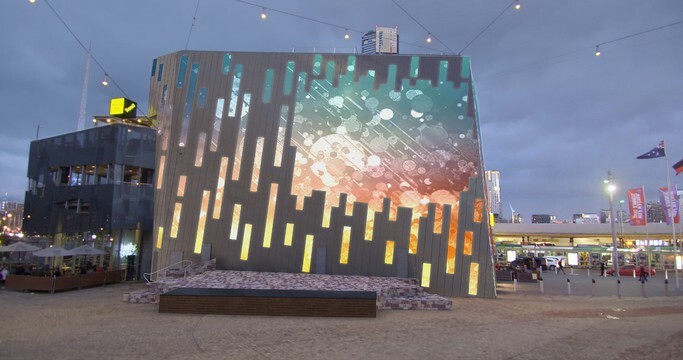 Featuring vertical beams of LED lights that extend up to 50 metres high, the display will be controlled by a weather station on the roof of the building that combines with the Bureau of Meteorology’s weather feed. Kind of light creation : The Light House: 888 Collins St is a weather-reactive light facade made of 35 vertical beams of LED light. Each pixel acts as a low-resolution screen, displaying a whole new light language that visually interprets the weather, which was envisioned and formulated by Ramus. 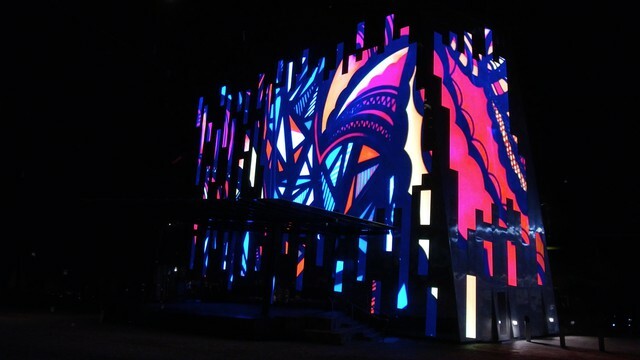 Resolution and transmitting behaviour : Content is displayed across 2.4km of custom designed and fabricated linear LED light fixtures embedded into thirty-five full height vertical fins that flank 5,500m2 of building façade. The entire building is illuminated by the energy produced by solar panels installed on the building. Urban situation : The Light House: 888 Collins st was built for the purpose of giving the community a captivating, connective meeting point, giving them a point of connection to the architecture and an understanding that it reflects them and their environment. Community or communities involved : This facade interprets real-time weather data, giving the community an instant sense of enjoyment as they see their own environment visual reinterpreted onto the building. Legal form : Please contact me for more details. Impact : This world-first installation is environmentally friendly and sustainable, as it is run by solar power. The lights themselves have a lifespan of approximately 100,000 hours which equates to about 30 years of use and it’s powered by solar panels, so it is self-sustaining. All design steps are being taken to ensure it is a low maintenance project.